Global Initiative for Food Safety has identified four different targets that can be the object of certification in the agro-food field: food safety, food quality, food protection and lack of food frauds. 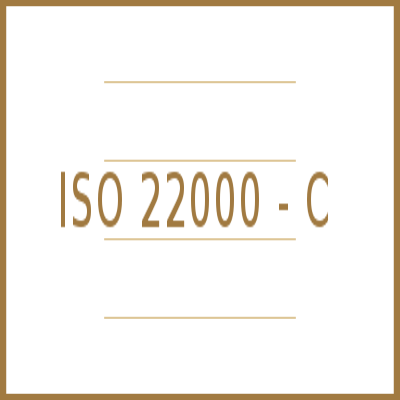 Certification in compliance with FSSC 22000 ISO 22000:2005 + ISO TS 22002-1:2009 (for food products) or ISO 22000:2005 + ISO TS 22002-4:2013 (for food packaging). 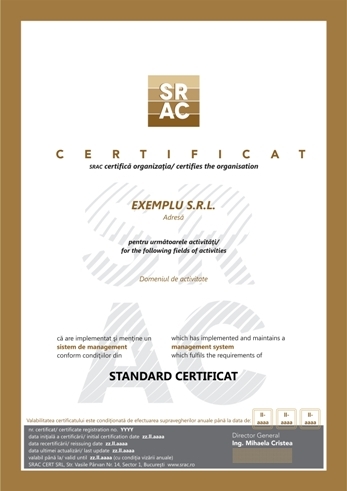 Thereis a new quality module in the certification offer for some certification schemes as IFS, BRC, FSSC 22000 and, because the operators from the food chain show interest for the certification in compliance with both ISO 22000:2005 and ISO 9001:2008, SRAC CERT has included in its public certification offer the integrated certification ISO 22000 and ISO 9001 under the name „ISO 22000-C”. Because of the fact that the demanding requirements from the retail area of the food chain determine exigence in the certification requirements and the ISO 22000 certification is performed in competition with other certification schemes, for an increased trust in the market there is a more consistent auditing of the reqiurement 7.2.3/ ISO 22000:2005. During the audit a special focus is on the selection of requirements considered to be important (K.O. or fundamental) in the field of food safety in the schemes IFS/BRC, for which the auditor has to record supplimentary findings through narrative text. But , as the audit addresses to the management system, it is not based on the simple record of conformity or non-conformity, it also offers the advantages of a profound assessment of the correlations between the elements of the system. Similarly with the IFS/BRC questionnaires that contain the text of the requirements for which the auditor shall record conformity/non-conformity evidence, in the integrated questionnaire used for the integrated audit the reference requirements text was introduced. Besides the ensurance of concentration in the gathering of information on the requirements from the reference standards, with the purpose of avoiding the irrelevance of records, the use of a sheet that is logically similar with the IFS/BRC forms offers to the operators the possibility of easily moving from the audit in compliance with IFS/BCR to the integrated audit ISO 22000–C. Following the integrated audit the integrated certificates of conformity are issued.